Wed 9:00 a.m. 4:00 p.m. The 2018 450 XC-F is the ultimate READY TO RACE cross-country race machine. 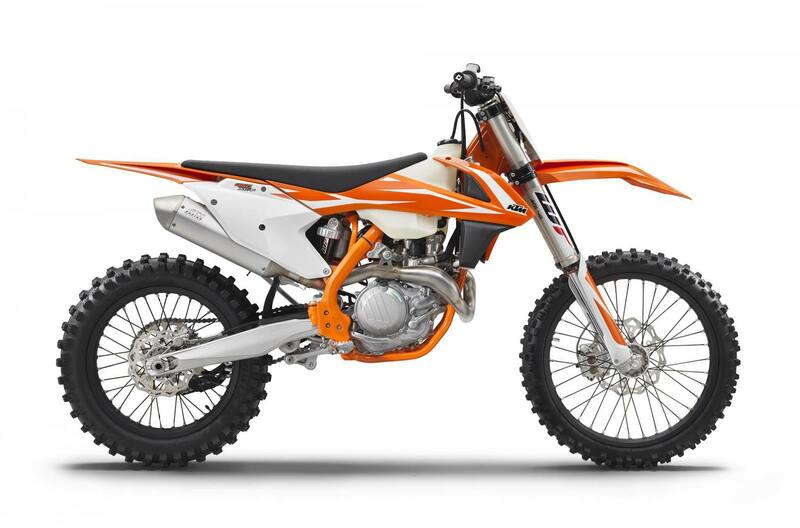 Building on the updated for 2017 450 SX-F, KTM’s engineers have checked all of the boxes to make the 450 XC-F an off-road winner. Updated damping settings on the WP AER 48 fork and rear shock, new clutch plates and revised radiator guards further enhance the 450 XC-F. XC specific equipment such as the translucent polyethylene 2.25 gallon fuel tank, hand guards and an 18" rear wheel ensure that the 450 XC-F is unstoppable in off-road closedcourse competition. UPDATED WP AER 48 front fork with a sophisticated air spring design and separate damping for easy adjustment to any track condition, rider weight or skill level. A new setting improves damping. UPDATED rear suspension damping settings are perfectly matched to the WP AER 48 front fork. NEW radiator guards provide better airflow in muddy conditions. NEW C4 bearing fitted to the transmission shaft for a bigger overlap in the cases for improved reliability at high operating temperatures. NEW clutch plates from nitrated steel for reduced wear on the steel clutch basket. NEW stronger lithium-ion battery provides more reliable starting while still being extremely lightweight. NEW MIM (Metal Inject Molded) shift star provides a stronger surface for improved reliability. Handlebar clamps feature a separated lower clamp and bridge-type upper clamp for more torsional stiffness. KTM’s “No Dirt” footpeg design keeps the pegs pivot from becoming clogged, ensuring the footpeg is always in the correct position. Super lightweight Galfer Wave rotors, CNC machined hubs, Giant rims and Dunlop GEOMAX AT81 tires. Airbox and filter design provides maximum performance with fast “no tools” air filter changes. “No Dirt” shift lever prevents dirt from fouling the lever joint to ensure proper shifting in any condition. Suspension Travel Front/Rear: 310 mm / 12.2 in. ; 300 mm / 11.81 in. Front/Rear Brakes: Disc Brake 260 mm / 10.24 in. ; 220 mm / 8.66 in. Steering Head Angle: 26.1 deg. Wheelb.ase: 1,485mm ± 10 mm / 58.5 ± 0.4 in. Ground Clearance: 370mm / 14.6 in. Seat Height: 960 mm / 37.8 in. Tank Capacity, Approx: 8.5 L / 2.25 gal. Weight (without fuel), Approx: 101.4 kg/ 223.5 lb. Wed: 9:00 a.m. - 4:00 p.m.